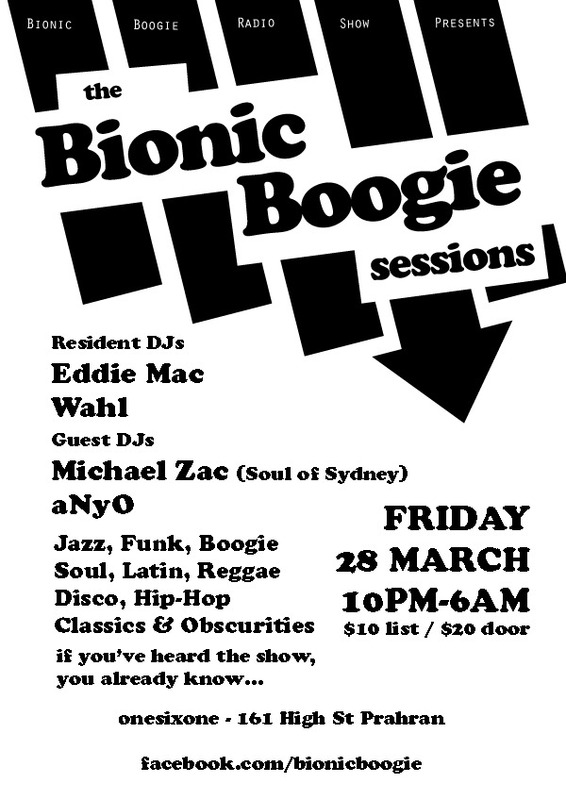 MELBOURNE: Bionic Boogie Sessions feat Michael Zac (Soul of Sydney) – Fri March 28 | SOUL OF SYDNEY FEEL-GOOD FUNK SOUL DISCO vibes & beyond. EDDIE MAC, WAHL and aNyO. Check it our for a night of late night disco, boogie and beyond. The Bionic Boogie Radio Show airs on KissFM every Wednesday night from 7:00pm – 8:30pm. Eddie Mac and Cam play a mixture of Funk, Boogie, Hip-hop, Dub, Jazz, Soul, Reggae, Roots, Jazz Fusion & Library records each week. All Vinyl, all good.